After successfully tested two beta versions of iOS 8.1 Firmware on iPhone, iPad, iPod Touch and Apple TV devices, the first major update to iOS 8.0 is now officially available. Apple iOS 8.1 (Build: 12B411) for iPhones, iOS 8.1 (Build: 12B410) for iPads and iOS 8.1 (Build: 12B410a) for Apple TV has been released. To update / upgrade / instantly, Download and Install iOS 8.1 IPSW Final Firmware for iPhone 6 Plus, iPhone 6, iPhone 5S, iPhone 5C, iPhone 5, iPhone 4S, iPod Touch 5G, iPad Air 2 6G, iPad Air 5G, iPad 4G, iPad Mini, iPad Mini 2, iPad Mini 3, iPad 3G, iPad 2G and Apple TV 3G via Direct Links through iTunes. Apple's latest available update of iOS 8.1 with Apple Pay Support, inclusion of new features, functionalities and bug fixes is instantly available. According to Apple, some iOS 8.1 features are limited to specific countries. 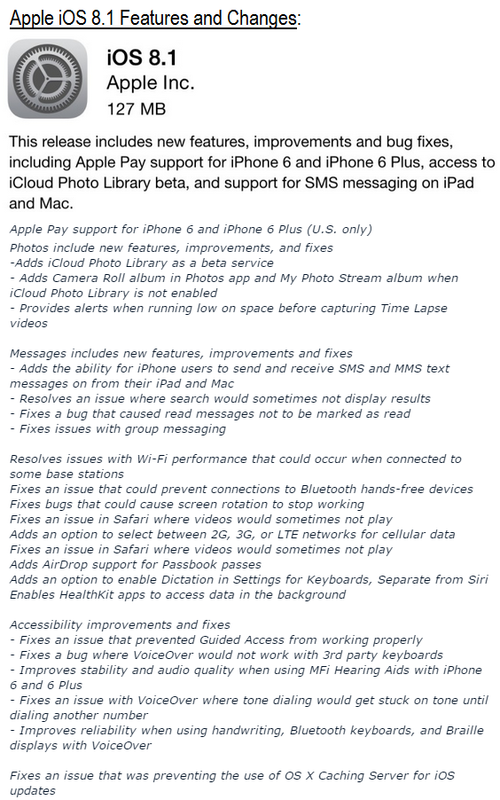 You can read full official changelog of iOS 8.1 Final Firmware in below image! How to Jailbreak, Download & Install iOS 8.1 Manually? Apple iPhone, iPad, iPod Touch and Apple TV device users can automatically upgrade to iOS 8.1 via OTA (Over-the-Air) wirelessly via Settings > General > Software Update option of settings app. The official Direct Download Links of iOS 8.1 Firmware IPSW File for iPad Air 2 6G, iPad Air 5G, iPad 4G, iPad Mini, iPad Mini 2, iPad Mini 3, iPad 3G, iPad 2G, iPod Touch 5G, iPhone 6, iPhone 6 Plus, iPhone 5S, iPhone 5C, iPhone 5, iPhone 4S and Apple TV 3G is attached below. It seems that people is waiting to Jailbreak iOS 8, iOS 8.0.2, iOS 8.1 Firmware, but unfortunately, no Untethered iOS 8.1 Jailbreak is available yet from Pangu or "evad3rs" Evasi0n Jailbreak Tools!